After sixty-eight Sundays reporting to you from Columbia Road Flower Market, I shall be widening the scope of my stories in future to bring you a weekly report from across the Sunday markets of the East End – either Brick Lane Market, Petticoat Lane Market or Columbia Rd Flower Market. As before, I will be publishing pen portraits of the traders, but you can be assured that I shall also continue to show you pictures of the plants and flowers that I buy at Columbia Rd. To mark this change of gear, I am publishing these short excerpts from “Sunday Morning East & West” written by A. St John Adcock in 1902 for “Living London,” the first mass-market publication to use photography as social reportage. Readers who know these markets today may draw their own comparisons with this description. “…Across the other side of London at this hour there gathers a surging, struggling, closely-packed mob, elbowing and shouldering hither and thither sturdily. Here the sun glares down upon a dusty malodorous atmosphere, for you are in the East, and this is Middlesex St, unofficially known as Petticoat Lane. Arriving in Bishopsgate, a little before eleven, you might have seen the tide of well-dressed or decent church-goers and heard the church bells ringing placidly in the West, but the moment you enter the “Lane,” the pealing is inaudible in the nearer clamour of human voices. This tall red building is the Jews’ Free School, and the droning of scholars at their lessons floats out the open windows and mingles with the howls of fish salesman, the wails of the lemon seller, and the raucous patter of the cheapjack. You pass from a butcher’s, to tinware, crockery, toys, fruit, hat and cap stalls, confectioner’s stalls, boot stalls, more cheap jacks, more fish stalls, more clothiers, and pretty well of them are Jews. Now and then you collide with a man who, having no stall, careers about in the crowd with a stack of trousers on his shoulder, and flourishing a pair in his hand implores you to take your choice from his stock at “a dollar a time.” Opposite an earnest man in his shirt sleeves bellows over a glass tank, “Ere yar! The champiun lemun drink – ‘apenny a glass. ‘Ave yer money back if you don’t like it!” Just beyond, a clothier mad with zeal has leapt upon his stall, and is frantically waving a coat before the eyes of the crowd. “As good as the day it was made!” he shrieks, “Look at it for yerselves.” And he hurls it at the simmering masses and they toss it back to him. The fair overflows all the streets branching from Petticoat Lane and, diverging to the West, you may penetrate to Cutler St and Phil’s Buildings which are wholly given over to clothiers. Going farther East by way of Wentworth St, which is as rampant as congested as the “Lane” itself, you emerge on Spitalfields, where the Market is half open, trafficking with costermongers, whose trucks and donkey carts are huddled outside it. The turning by the church brings us to Brick Lane, and Brick Lane leads us to Sclater St, locally known as Club Row, where you will find a Bird Fair in full blast. 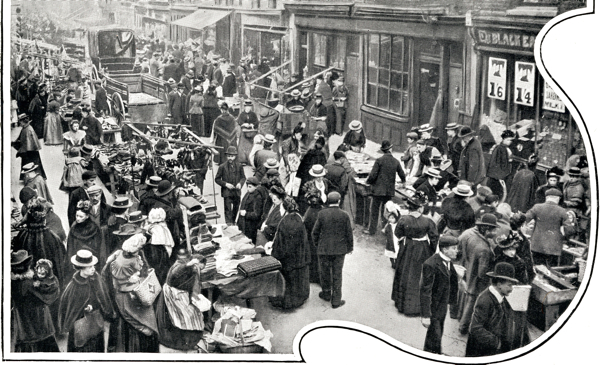 It is Petticoat Lane over again on a much smaller scale, hardly any women, less diversity, no side-shows, no frivolity in short, but strict attention to business. Most of the shops in Sclater St are kept by bird dealers, and their outer walls up to the first floor have all broken into an eruption of bird cages. Beside the shop doors and in the gutters, hutches and cages, towering one above another, swarm with rabbits, fowls, pigeons, thrushes, canaries, and smaller birds in amazing variety, and the sellers bawl against each other, and the birds crow, coo, quack, scream and sing against each other deafeningly. 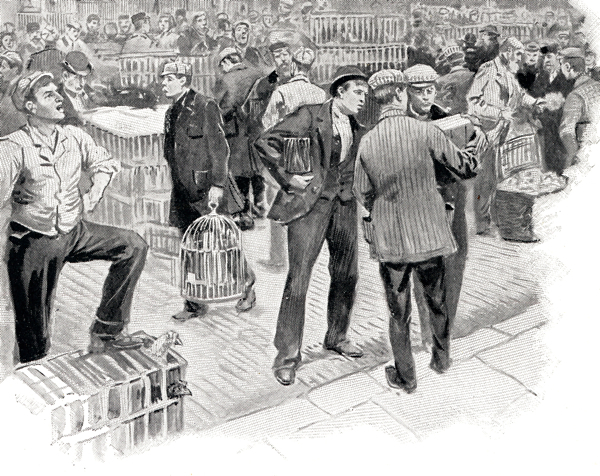 Men without shops or stands roam in the crowd carrying a cage or two and crying their wares. Men and boys waylay you in the crush, or on the skirts of it, with wriggling heaps of rabbits at the bottom of small sacks, and offer you the pick of the bunch for sixpence. In spite of the vast changes in the social landscape that separate us from this report, the markets of the East remain as exuberant with chaotic life as they did a century ago, as any visitor will attest. Even though the Jewish community has departed from Petticoat Lane and the bird market in Club Row is no more, the crowds continue to come unceasingly every weekend, surging through the streets of the East End to visit newer attractions like Columbia Rd Flower Market, the Truman Brewery Markets and the renovated Spitalfields Market. 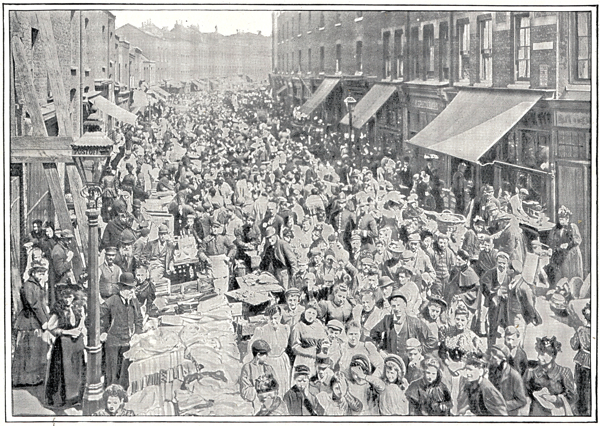 By contrast, Sclater St and Bethnal Green Rd are the last scruffy markets where the spirit of this report still lingers, and there – remarkably – cycle spares are sold on the same spot today as over a century ago. I hope you will join me each Sunday over the coming weeks, months, and years, as I introduce you to all the traders who carry the life and history of these celebrated markets. A Scene in Brick Lane. Sunday morning in Middlesex St.
Ronald Searle & Kaye Webb’s visit to Brick Lane in 1953 Dog Days at Club Row Market. A fantastic film and account. The man that I remember from the lane in the 1940′s was a stallkeeper who’s wages were beer. He had a galvanised bucket into which a dipped a pint pot, the bucket was refilled as it emptied. You had to watch your pockets in those days. Your site goes from strength to strength. The Petticoat Lane film is wonderful. If only there had been sound.